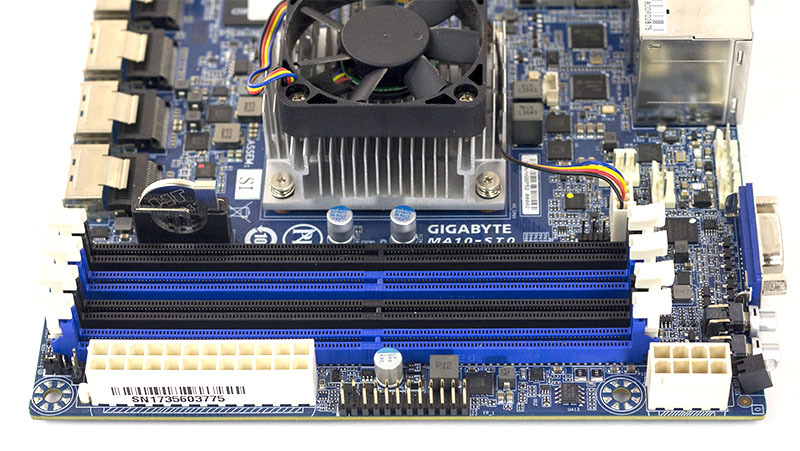 The Gigabyte MA10-ST0 is a fascinating storage platform. 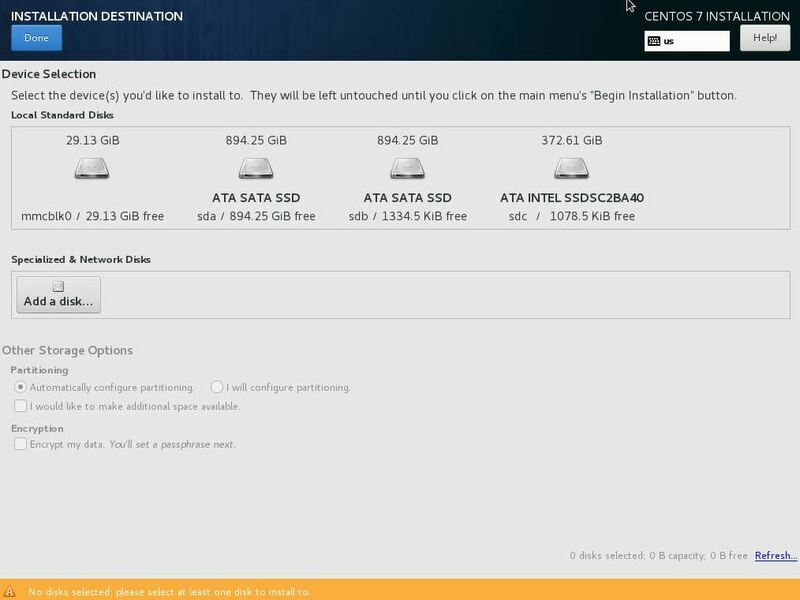 If you are looking to build a network attached storage (NAS) unit with 16 drives, the traditional go-to has been to use an additional SAS controller. With the Gigabyte MA10-ST0, one has a powerful 16 core CPU, 10GbE (SFP+) networking, up to 16x SATA III ports, and even a boot drive all in a compact mITX platform. The Gigabyte MA10-ST0 is small. 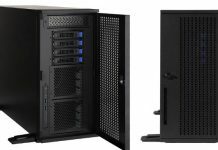 It is a 6.7″ x 6.7″ mITX form factor which means it fits in everything from compact chassis to rackmount servers. Given its compact size and plethora of features, there are components covering the PCB. With the newest Intel Atom C3000 series you can use up to 128GB in 4x 32GB RDIMMs, a 4x boost over previous generation platforms. Boosting RAM capacity means that you can virtualize more in an edge device. Virtualization has become a major theme for NAS units recently as SMBs are able to bring services in-house and lower the load on WAN connections. One can change the orientation based on the type of chassis used and the airflow pattern required. Now for the big feature. There are four SFF-8087 ports aligned perpendicular to the motherboard. While these were commonly used for SAS in the 3.0gbps and 6.0gbps SAS generations, on the Gigabyte MA10-ST0 they each provide four SATA III 6.0gbps for a total of up to 16 SATA ports. Given the new Intel Atom C3000 series architecture, two of the four SFF-8087 ports are shared with the PCIe 3.0 x8 slot. 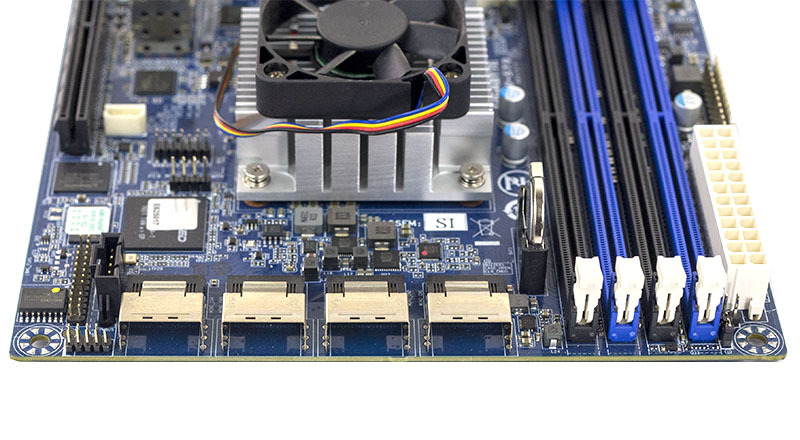 At the end of the PCIe 3.0 slot is a small chip from Kingston. 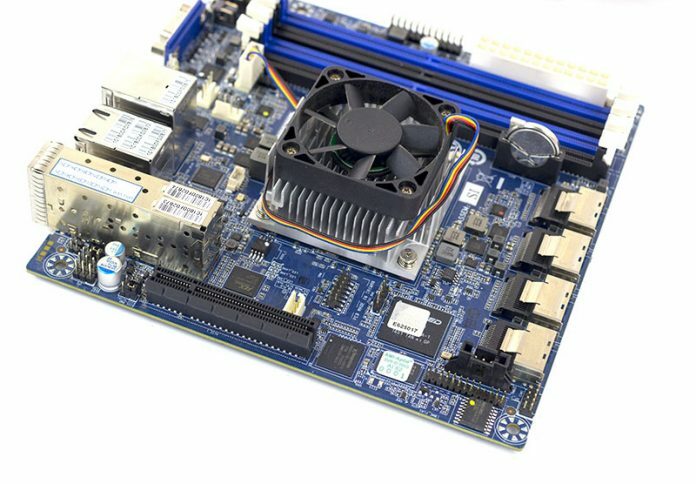 That is another one of the Gigabyte MA10-ST0 unique features. It is a 32GB eMMC package. 32GB is plenty for many embedded OSes and hypervisors. eMMC is generally a more trusted storage media over a USB stick. 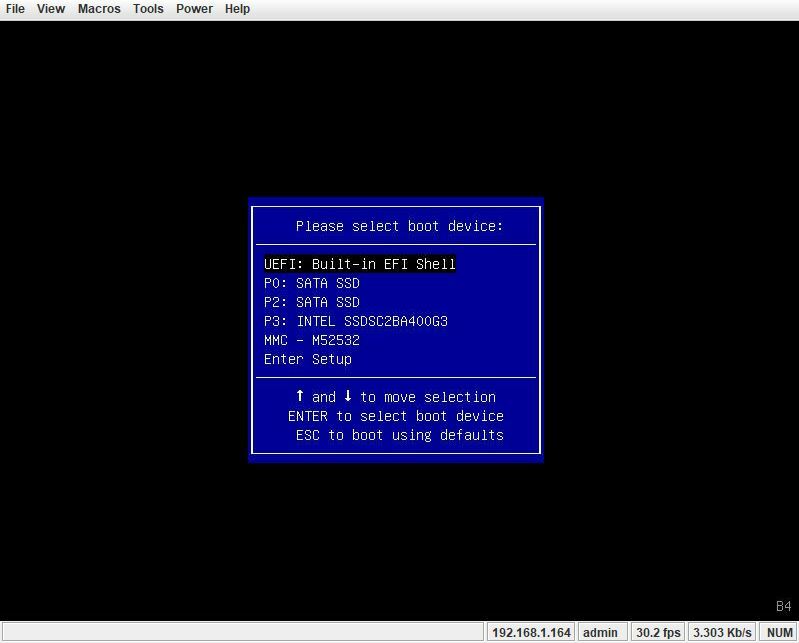 As a result, you can use the 32GB eMMC drive as a boot device without having to use one of the valuable SATA III ports. The one drawback of an embedded eMMC device is serviceability. Many OS vendors have seen users utilize eMMC boot media as storage caching or log devices which can wear out media. If that happens, a soldered component will likely require a board swap to replace. Still, the solution is unique and one we think has a lot of merit. The rear I/O has legacy KVM cart ports like the VGA and USB 2.0 ports. There are no USB 3.0 ports on this platform. These days, instead of using local KVM, most users will instead rely upon the out-of-band management via the RJ-45 connector above the USB ports. The stack of two RJ-45 ports combine for dual 1GbE networking. Perhaps the standout rear-panel I/O feature is the dual SFP+ 10GbE cages. That gives high-speed I/O capabilities to the platform. If you are going to move from a simple NAS OS to a higher-end hyper-converged style installation, this networking combination is a great addition to the Atom C3958. Next we are going to take a look at the remote management capabilities and block diagram of the Gigabyte MA10-ST0 and then look at the performance, power consumption, and our final thoughts on the platform. So where can I find this board? I just looked on eBay, Amazon, and Google. I’m with Kevin on this one, I just checked with all the consumer shops and none have this board in stock. Ingram Micro, Synnex, Westcon Comstar, CDW & Tech Data are all showing no stock. Kevin and Magnus – I think this is a product you need to call for at the moment. 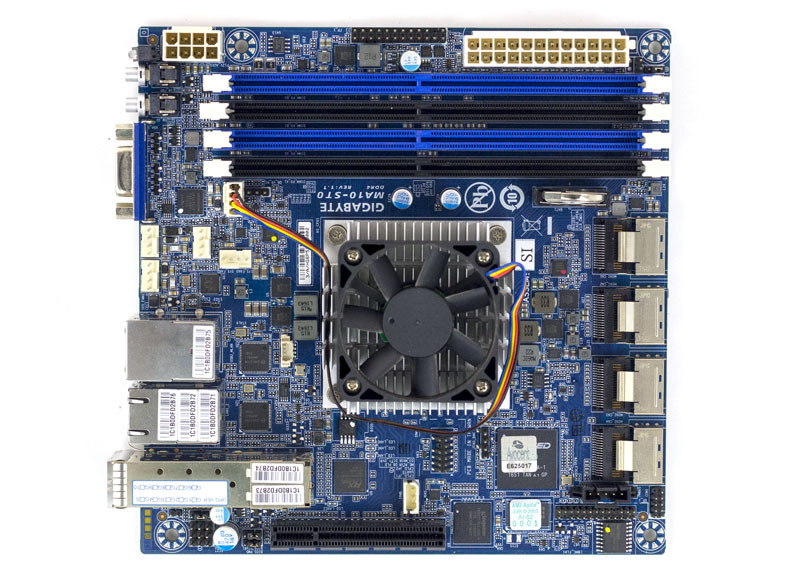 Can we have an update on the OS compatibility of this board ( https://www.servethehome.com/testing-the-gigabyte-ma10-st0-with-pfsense-2-4-release-and-freenas-11-u4/ )? This article has piqued my interest. I’d also be interested in current QAT compatibility and how-to’s with different OS’s. At home, I run ESXi 6.5 with pfSense 2.4.4 dev and NAS4Free 11.1.0.4 (prefer the UI over FreeNAS) virtualized on top (separate boxen now). pfSense is nice virtualized because Suricata sees E1000 NICs, and its IPS runs flawlessly then. If ZFS is run virtualized, it is best with SATA pass-through enabled (I think this from STH). Does the SATA controller show up as only one controller? Without multiple controllers, SATA pass-through isn’t really plausible. TigerDirect is like $840 but call for stock. How can a product be given a 9.5 review score with no context of price or availability? is it a 9.5, regardless of price? At $2K is it a 9.5? What if it’s $500? That and the fact that we can’t seem to find this anywhere are the only things that frustrate me with the otherwise great review… that… and the benchmark images are pretty low-rez and tough to make larger. Has anyone tested the 10gbe throughput on the 10gbe nics from any of the 10gbe c3000 boards. Just curios if a small ssd pool would be bottle necked by the 10gbe nic or the cpu with samba? I would not worry too much. First of all it’s eMMC an if you over-provision the device (who needs 32GB, 16 would be plenty) it will last a long long time. 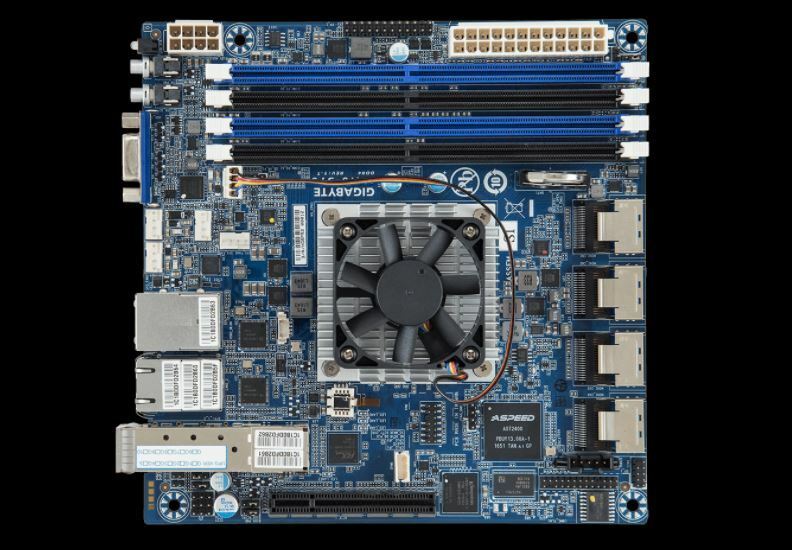 Does the board support SAS drives connected to an expander or is it limited to SATA? Eric Smith – mentioned in the article but this is SATA only despite using SFF-8087 connectors. None on Newegg, none on Amazon…. And no idea of price…. But this board has “FreeNAS Dream’ written all over it! The price must be wrong, Over $1K for this board makes it ridiculous. For a home server, we can buy a lot of hardware if we are not looking for enterprise class hardware. How does the board perform with meltdown patches enabled? As far as I could see, the Atom C3000 chips do not support the INVPCID instruction and might see a pronounced performance degradation due to TLB flushing with I/O intensive workloads. Did you see any of that in your testing? Sixteen cores matched to sixteen SATA drives, 2x10GbE for redundant data link + 2x1GbE for redundant management link, embedded boot drive, no RAID on-board, and it’s an Intel platform with QAT… seems a lot like it was designed specifically for use as a Ceph node. No onboard BBU capability when you included SAD and fiber capabilities?